Last week, the Lord did offer up a challenge...the kind of challenge I hardly want to acknowledge out in the open in front of B and my close girlfriends. 'Cause I know I'll never be able to pull it off on a Christ-like level, but as we learned last week from Graham Cooke, God is calling us to do the impossible. We can't do the things he asks us to; only he can. What is my seemingly insurmountable task from God? He posed this profound question to me: What if you chose, and I mean actively made the decision, to never be offended by anyone....even if they are being offensive? How would your life look? How would your relationships differ? To which I said, "Ummm, Lord, have you met people? They're like....so offensive!" He countered, "Sometimes (in other words "often") you are offensive." My reply: "Yeah....well...fine, I'll try." News Update: Guess what? I've failed several time since receiving the challenge. We are programmed from birth for negative emotion; we accept it as part of our beings and ridding ourselves of it is like trying to quite crack cold turkey. It's a dirty secret none of us like to admit: we readily accept negativity more often than we do forgiveness and patience. 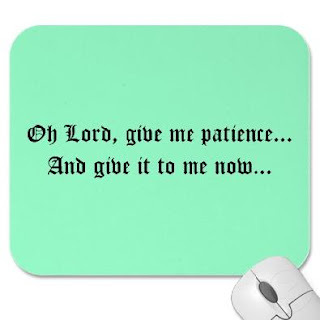 So, to avoid sounding preachy, let me repeat it: I fail daily in being totally patient and forgiving and Christ-like. I have to admit, though. The Lord's challenge has caused me to stop and really consider where my heart is when I feel provoked to anger. What if I just let go of the negativity that I would normally allow to envelope me? Maybe the love of Christ would start to shine through me a bit more daily. Has the Lord challenged you lately? Feel free to share so we can all up the ante in our walk with Christ!